Juan Govea, a teacher at Salinas High School, is frustrated by the common practice of dismissing Salinas as a rough or dangerous place. What distinguishes his hometown, he says, is its beauty. But how to change that misperception? At the beginning of June, he decided to take matters into his own hands—and his smartphone. So he made a point of snapping photos of places that struck him as beautiful as he traveled around the city every day to teach, run errands, or visit family. There were so many places and scenes to choose from. And, even though they were familiar to him, Govea was amazed by all the city’s distinctive buildings—from old Main Street storefronts to taquerias on Alisal. He photographed formal landmarks like the city train station and the Fox Theater on South Main Street. And he took photos of spots that wouldn’t necessarily draw the attention of visitors to Salinas, such as Valley Center Bowl and Kristy’s Donuts. As a summer project, Govea posted one photo a day on Instagram, and used the hashtag #salinasisbeautiful. Here are some of the highlights from Govea’s photography of the city’s architectural landmarks and everyday pit stops. (Govea, of course, is interested in Salinas’ natural beauty, too. A gallery of those images is also available). 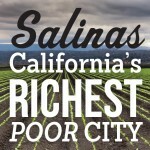 This gallery is part of Salinas: California's Richest Poor City, a special project of Zócalo Public Square and The California Wellness Foundation.